O'Ryans Village Candy Blog: Necco Conversation Hearts In The Original Flavors. 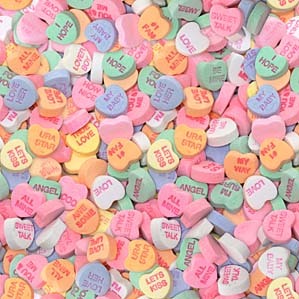 Necco Conversation Hearts In The Original Flavors. Necco tiny conversation hearts in the original flavors are still available , but very hard to find. For some strange reason after many of years Necco decided it was time to change the flavors from the classics to new flavors. This change was made a few years ago and many have been very unhappy with this change. is just way to many hearts to eat. We were lucky enough to find a company that purchases these conversation hearts and repackages them under their own brand name. Heck who cares what the name is on the package as long as they are the Necco original flavors right ? Banana, Lime, Grape, Cherry, Orange and Wintergreen are the original flavors. None of the lemon, green apple or blue raspberry flavors in the original bags. If you are unsure if you are buying original flavors or the new ones, check the bags, if they have blue hearts in them, it's the newer flavors. that eat candy. They are always changing the flavors to appeal to the kids. Hey what about us adults that enjoy the candy from the good old days ? So if you are looking to buy Necco original conversation hearts your search is over. Make sure to buy a few extra bags, the shelf life is pretty long. We always hold our breath every year never knowing from one year to the next if they will be totally gone.